This entry was posted in November 2012 Posts and tagged Birthday surprises, Declining health, Elderly parents, Fathers and daughters, Mental health, Parents, Surprise party. Bookmark the permalink. 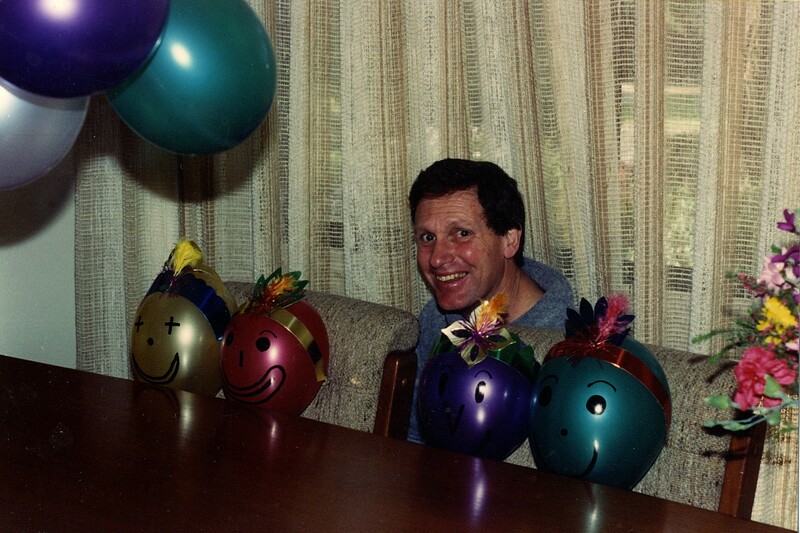 You really have a talent when it comes to drawing faces on balloons, what a waste…Your dad is an awesome character, sorry he’s on the decline, but I’m sure he’s giving you more amusing stories for the old brain library in the meantime. Touching story Simone. Very thoughtful actions. And it’s nice that your dad still appreciates it. I can also see that you’ve a steady hand when it comes to applying balloon faces. Have you considered children’s parties? Bittersweet memories. I believe that there is a connection between what we put into life and the rewards that we reap as time goes on, although sometimes we simply need to accept inevitable outcomes. Thanks. I’ll be seeing him again at Easter so I’m hoping he might be a bit better by then. Sorry to hear your Dad’s not well. If you need a local whatever, let me know. Oh, and I am reading all of your blogs, but they come straight through to my email. Thanks Damian. He’ll live to see a few more days yet (albeit through a haze of increasing insanity!) … I swear he’s like a cat with more than nine lives. Agree totally. I might go Pet Rock hunting tonight.